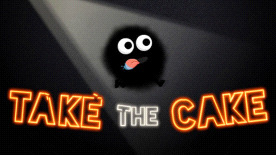 Test your wits in Take the Cake, a puzzle platformer that challenges you to help a friendly furball retrieve his stolen cake from evil robots. Built around physics and color-changing abilities, the game lets you interact with a handmade rocket, change the furball's color, and fight bosses to progress through 27 levels across five different environments. Can you help Frank retrieve his cake before it's too late? Such a beautiful and delicious cake! It's no wonder that it was stolen by robo-thieves! But what would robots want with a cake? Join Frank the Friendly Furball on his quest to take the cake back from the robots. He'll jump, inflate, and bend gravity - all to satisfy his sweet tooth. All rights reserved. All other trademarks and copyrights are the properties of their respective owners.